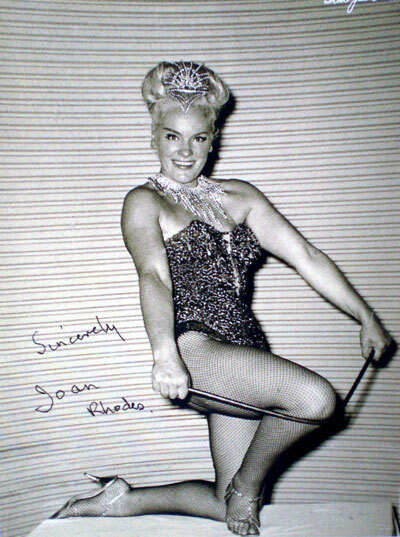 Joan Rhodes was celebrated in the fifties and sixties as a woman of exceptional strength. She performed her speciality act worldwide, appearing in cabaret, variety and vaudeville with her amazing strong act. Joan was a regular visitor to Brighton and appeared at the Sports Stadium in West Street Brighton, the Hippodrome in Middle Street and many other venues. 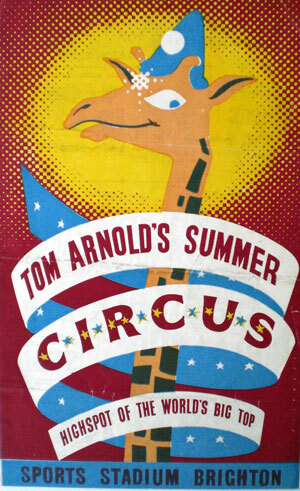 In the fifties she was signed by Tom Arnold and appeared in many of his famous ‘Ice Circuses’ which ran most summers in Brighton. Long before Uri Geller she could bend heavy steel bars that no man in her audiences would ever dare attempt to try and buckle! She could break six-inch nails with her bare hands and could tear a 1,000 page London telephone directory in half with ease! Not merely in half, but quarters! Despite her great strength, she was not muscle bound in any way and there were no real tricks in her act. She stunned audiences with her amazing feats of strength and her stunning good looks and figure! She was billed as ‘The Strong Lady’ and the sight of Joan’s statuesque figure clad in a sequined leotard, high heels and fishnet stockings would set many a male heart racing! Her strong resemblance to the young actress Diana Dors went a long way to make one of the most popular acts of the time. Her finale would include choosing a male from the audience who she would promptly lift above her head, much to the delight of the audience. On leaving the stage, not a hair was out of place and not a scratch on her bright-red nail varnish! On one famous occasion when touring with Bob Hope, he was entertaining the troops overseas at the time, she lifted Bob high above her head half way through his act. Unusually for Joan she lost her balance and they both fell crashing to the floor in a heap! This brought hoots of laughter from the troops who thought it was all part of the act. Having spent much of her life being feted by the rich and famous, Joan is now in happy retirement although still remains very active at showbiz functions. To quote Joan on a recent visit to Brighton; “when I appeared at the Sports Stadium and tore telephone directories in half they were three times as thick as the present ones, now they are so thin even a mere man could tear one in half “! Beauty, brains and a figure to die for! Great article of a very interesting woman. I remember very well, watching Joan Rhodes on TV. Mr Chepstow, can you confirm my guess that the man standing on Joan in the picture “Amazing feat of strength” is the giant Chris Greener, for long the tallest man in Britain? Yes you are correct, well done. Just watched Paul O’Grady, what a truly inspirational lady. Hi, I am Features Editor of Health and Strength Magazine. I have written much on Joan in the magazine including when she was honoured by the Oscar Heidenstam Hall of Fame awards. She is a lovely lady, and I am also plugging her book ‘Coming On Strong’ in Health and Strength and Muscle Magazine International. would love to find more photos.David. I believe that the giant was called Ted Evans – he was 7ft 8 1/2 inches tall. Can anyone tell me if Joan had a tea bar in Crouch End in London? I used to go there. Thank you. Does anyone know how to contact Joan directly. I believe that we are related through marriage. It would be good to know for sure. You can contact Joan Rhodes through The Stage Newspaper. They will pass on correspondence to her. I worked as a stage hand on one of the Tom Arnold shows. I remember Joan Rhodes well. Used to see her backstage while she was waitng to go on. She was indeed a Llvely lady. The retired Brighton Tigers Goal tender Gib Hutchison was the Stage Manager. A real gentleman. I recall some of the acts, the Bernardi Brothers, Joan of course. A Frenchman on a performing Horse, had the RSPCA after him at one stage. I think the giant standing on Miss Rhodes (by the way…wow) is South African boxer Ewart Potgeiter. http://www.thetallestman.com/ewartpotgieter.htm Definitive proof that the gentleman is Potgeiter.